1. For the Béchamel sauce: In a medium saucepan, melt 3 Tablespoons of butter. Whisk in the flour and cook for about one minute. 2. Whisk in the milk and bring to a boil. Reduce heat and simmer until reduced and slightly thick. 3. Remove from heat and add 1/2 cup Gruyere and Parmesan cheese and stir until smooth. Season with salt, pepper and nutmeg, to your taste. 4. Preheat broiler. Place 6 slices of bread on a baking sheet and top with 2 slices of ham and half of remaining Gruyere. 5. Broil until the cheese melts, then top with the remaining 6 bread slices. Spoon Béchamel sauce on top of each slice and sprinkle with remaining Gruyere. Broil until cheese is melted and slightly browned, about 2-3 minutes. 6. While the sandwiches are broiling, melt butter in a skillet and fry eggs. Cook until whites are cooked through, but the yolks are runny. 7. 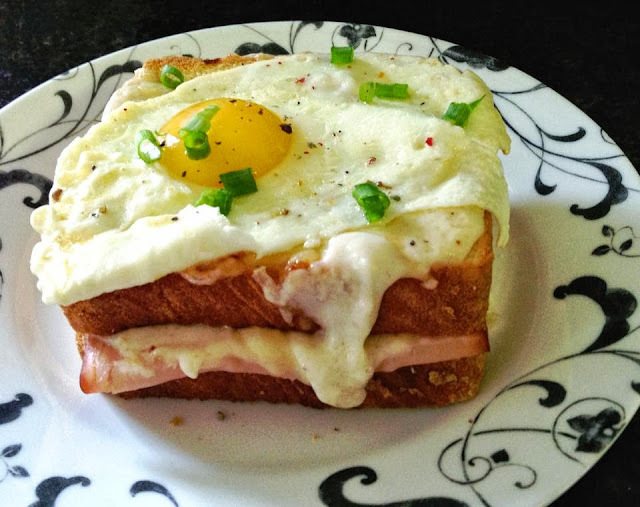 Remove sandwiches from broiler and carefully top each with a cooked egg. You may add salt, pepper and sliced green onions. 8. Serve onto a plate and enjoy! Looks so wonderful! I can just see the yolk bursting and saucing the sandwich with all of its richness. Diana, I passed along your comment to Rachael! She say - try it! She would answer herself but she is busy having a baby lol!